Do you guys really have food allergies? Co-directors Michael and Lily both have several food allergies/sensitivities, and were therefore able to create this video by drawing from our experiences with the subject. The rest of the cast and crew are allergy-free (as far as we are aware). Why does everyone rush for the pizza at the end? Wouldn’t it kill them? 1) While fatal allergies do exist, most people with food allergies will not die from having food they are allergic to; they will just get sick, to varying levels of seriousness. 2) Nearly everyone with non-fatal food allergies has given into temptation on multiple occasions. We regret it later, and yet we do it again, because people have such notoriously short-term memories, and sometimes the temptation is just too much! To us, the pizza-rush at the end of the video is about giving into temptation. And think of it this way: If the film were to have an epilogue, it would probably consist of everybody lying around in agony and vowing never to eat pizza again. We have no idea. We’ve given it a shot, and gotten kicked out of parties for it. Why did you make this video? For Michael (Writer/Co-director/Valjean) and Lily (Co-director/Cosette), who both have multiple food allergies, this was a cathartic passion project, and a chance to give others the opportunity to laugh at a subject that usually causes people nothing but pain and frustration. We know firsthand how hard and scary it is to live a life with such limited choices, and believe with all of our hearts that the best medicine is to learn to laugh at it. This video was designed to give that chance to others, and it’s been a wonderful privilege to hear from so many people whom this video enabled to do just that. Are those your real voices, or are you lip-syncing? The answer is: both! In a musical film, you almost always pre-record vocals ahead of time in order to preserve the quality of the soundtrack. But those are our real pre-recorded voices, and during filming we were still singing at the top of our voices. Just ask our neighbors! Will you be making more videos on this topic? “One Grain More” has been an incredibly positive experience for all of us, and we are most certainly interested in working on future projects together, whether health-related or otherwise. Directors Michael and Lily have both been involved in talks for creating new pieces on commission; if you have a project proposal for us, we would love to hear about it! Just contact us. A total of 300 hours (for Michael), which included writing the lyrics, recording the backtrack, recording the vocals, editing and mixing the vocals, creating a shot list, acquiring costumes, two full days of filming, and editing. At the bottom of the party invitation, where it lists the foods that have to be avoided, does it really say “giraffe”? It surely does! And for everyone out there who thinks that this joke is uniquely strange in the context of a video about oat-milking and comparing quinoa to nasal excrement, we encourage a little perspective. Are you guys available to perform live? We are! 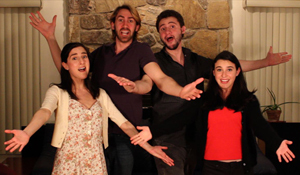 All four of us are professional musical theater actors, and have been very receptive to inquiries about performing the song live at functions or on television programs. To inquire about booking us for your event or television show, please contact us.